For a nature-lover, fond of watching migratory birds, the largest water reservoir in Northern India the Pong Dam is the place to be. The place is hardly 70 kms from Pathankot and a smooth drive from here will take you to a place with abundant with natural beauty and splendour. Every year during the winters, the Pong Dam reservoir in the Kangra district of Himachal Pradesh, offers itself as a host to these winged guests from Siberia and Central Asian countries including Afghanistan, Mangolia, Russia and China. The entire wildlife sanctuary, spread over an area of about 307 sq. km, can be seen dotted with these exotic migratory birds. These birds exhilarate the visitors with their presence. Pong Dam came into existence in 1975 and since then the birds adopted this wetland as their winter abode. During 1983 the wetland was declared as a wildlife sanctuary, in 1994 it was recognised as a wetland of national importance and in the year 2002 it was acknowledged as wetland. The wetland has the immense potential to match the country’s best waterfowl protected areas such as Koeldeo (Bharatpur) and Chilka in Orissa. The wetland attracts more than 1.5 lakh birds annually during the winters (Mid Oct-March). The safe and diverse environs of the lake have started tempting some of the species of the birds like, Cormorants, Egrets, Herons, Terns, for staying back in the wetlands for the whole year and breed. The Government is also making the best efforts to protect the unique ecosystem and to provide safe and congenial habitat to the migratory birds. The efforts by the management include protection, habitat improvement measures and eco development activities. The wetland is known for diversity of its avifauna. About 225 species of birds have been recorded to be present in the immediate surroundings, including 69 species of water birds. The birds like variety of Geese like Bar Headed, Grey Lag and different species of ducks like Shovellars, Pintail, Pochards, Spotbill, Mallards, Ruddyshell, species of cranes like Sarus and Demosile, and species of storks like Openbills and Wooleyneck, Darters, Herons, Egrets, Gulls, Terns, Cormorants, Coots, Grebes etc. can be spotted here during the season. The wildlife wing of the Forest Department ascertains the exact number of different species by conducting a census of these birds. The census also helps to know the habitat for the various species so that sustained efforts can be made to ensure proper and effective management of the wildlife sanctuary in the future. It also helps in ascertaining trends of population of migratory birds by introducing and increasing agricultural crops like wheat, grams etc. around the lake. Another aim of the census is to compare the densities of the birds each year to ascertain the effects of the management in the sanctuary. Pong Lake continues to remain a secluded spot. May be due to security restrictions around the dam area. However, State Government is trying to bring the Pong Lake on the international tourist map. A spacious and beautiful restaurant was opened here two years back. The construction of a civil terminal at Pathankot airport opened recently and is likely to give impetus to the flow of tourists to Pong wetland. According to V.K. Singh, Conservator, Wildlife Dharamsala,“ Last year 1.42 lakh migratory birds arrived at the Pong Dam reservoir, while in 2004 the number of winged guests from Siberia and Central Asian countries was 1.30 lac. Till date more than 60,000 migratory birds have landed at different places of Pong Dam reservoir. The Wildlife Department of Himachal Government has also formed an anti-poaching group comprising local volunteers in order to keep a vigil on poachers. These teams have nabbed a few poachers and action has also been initiated against them. The department is also working on the improvement of habitat for these migratory birds and feeding them is also being taken care of. Since the Pong Dam reservoir attracts tourists from the country as well as abroad, the wildlife department has pressed three boats into service for boating at nominal rates and one can enjoy boating from Nagrota Surian and Pong Dam to Rainser Ghari and other islands and watch migratory birds from a close distance. If one wishes to live out the magic of this song of yesteryear, the place to be is Naldehra and that too in the exclusive boutique hotel called the Naldehra Chalets. This upmarket resort is just 22 kilometres away from Shimla and just 300 metres from the famous golf course, built here by Lord Curzon, some 2050 metres above sea level. It is also close to Mashobra of the Wildflower Hall fame and the village is Durgapur. The Chalets resort is indeed a very exclusive place with cottages built from pinewood and technology imported from Finland. Yatish Sood, the proud owner, says: "It is eco-friendly pressed board and no Himachal trees were slaughtered to build this retreat." Each cottage is a work of art with furniture to match. Care has been taken to make the visitors comfortable in the very lap of nature. Forests surround the cottages on the mountaintop and there is also the enchanting view of the deep valley. The tall pine and fir trees make the air fragrant. The city with all its cares and troubles seems very far away. The most delightful part of staying at the Chalets is the walk in the forest along a marked path. But for a few monkeys and birds or some good hill folks trudging up, there is no distraction. One can collect all the pinecones that one wants to put in the home in the plains and be reminded of the happy holiday. The place has become very popular with golfers for it is ideal to come here for a golfing vacation. The Golf Course is at a walking distance. It has nine holes, which can be played back to 18. Anybody can play at the Naldehra golf course by paying a nominal fee. Caddies are available easily. The course is ringed by stately deodar trees and has spectacular mountain views around. Staying at The Chalets, beginners can also learn golf at the Naldehra golf course. Golf sets are available on hire. Accommodation at the hotel is well-furnished rooms and suits with a choice of Log cottages, Apartment suites and Family cottage. All the rooms are equipped with modern amenities. Every window has a different view in the hotel. If tired of the quiet, one can turn on the piped music and care has been taken in the choice of songs which indeed transport one into a make-believe world of high romance: Dil dhoondta hai phir wohi fursat ke raat din or Chalo dildar chalo chand ke paar chalo. And even if the naughty moon is peeping from the cottage window, one feels that one is far beyond it. The name of the restaurant is the Garden Pavilion and is open to people who just come driving down from Shimla. The food is so good that one could overdo it or else go for a second round of the forest walk. 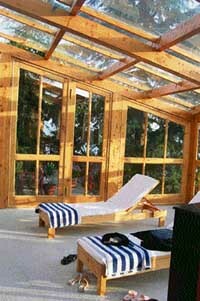 The resort has a bar, an indoor swimming pool and a children’s activity centre called the Little Cedars. There is a conference room too and one finds some interesting information about history of the area in visuals and accompanying text. The hall is named after Lord Curzon, who often camped at Naldehra for weeks on an end. His third daughter was conceived at Naldehra and was named Alexandra Naldera. If one goes by the number of honeymooners visiting the resort, there are bound be many more Nalderas around! Naresh’s paintings seem familiar, yet not. Since they come under the title ‘An Exhibition of Pahari Art’, we try to relate his works to the usual Pahari paintings we had seen earlier. The two-dimensional forms, trademarks of a Pahari painting, are there, but the expressions are not what one would expect. The earthy beauty of Himachali women is not lost, but the usual soft and dreamy expression is being replaced by harsh reality, what one can safely describe as the face of a workingwoman. That, in a nutshell, is the changing face of Pahari art. This is what Narersh Pandit’s latest endeavour is—to popularise Pahari paintings and he is doing this by mixing the traits of Pahari miniatures with modern art. “Pahari paintings are beautiful but they are no longer relevant to society. And they have been produced and reproduced so many times on the same line that one feels you have seen it all. So to make it make this art form interesting we have to keep on re-inventing,” says Naresh, who was in town recently for his exhibition at Punjab Kala Bhavan in Sector 16. The stagnation in Pahari paintings, according to this Mandi-based artist, came from the fact that half of today’s artistic community is either going modern way, deviating from their roots or while the other half is simply sticking to the age-old theme and techniques. “How many new themes can be spanned from Radha-Krishna ‘Raas-Leela’ and for that matter how a middle class man or woman relate to art works based on themes which are not remotely connected with reality,” he asks. In his attempt to bring the middle-class into art fold, Naresh has robbed some of the delicacies of Pahari paintings off and instead, infused a little harshness into the faces, just to remind you that there is another side to the delicate beauty of a Himachali woman. 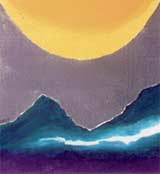 Along with his modern Pahari art, Naresh continues with his ‘Sun’ series capturing the source of energy in its gigantic form and mountains in its true form and texture. Once again, Naresh has simplified the three dimensional landscapes into two-dimensional view, in true Pahari style way. Executed in mixed media (acrylic and water colour), his paintings exude an aura of change in nature. A writer too (with three publications to his credit), Naresh’s lashes out at today’s exhibitionistic mentally of the younger generation. “Today art is more of pradarshan than anything else,” he says. But does not a little bit of pradarshan pays rich dividend in today’s world? “Well, for us artists the most beautiful experience comes during gestation period of a painting, the pleasure that an artists derives from the canvas, his hands and his eyes,” says Naresh and money, according to him, does not measure up to that. Well, maybe you need to have an artist’s sensitivity to understand that. I am not Napoleon Bonaparte, but like him, I love Weeping Willows. There are beautiful and healthy Weeping Willow trees in Fairlawn near Dhalli where the Himachal Pradesh Institute of Public Administration is located. There are these trees on the roadside of Shoghi Bazaar. One tree is just below the State Government Printing Press in Shimla. Sherwood and Kenilworth in Mashobra have quite a few. One nearest to the Mall is just below the Scandal Point where there used to be The Tribune Office a few years back. Weeping Willow with drooping branches is believed to have flourished in ancient Babylon some 3000 years ago, that is why its botanical name is Salix Babylonica. It travelled to London, Hampton Court in 1690. The legend is that the tree is supposed to have let droop its branches since 597 BC when the Jews were made captives in Babylon after the attacks of Nebuchadnezzar. It is unfortunate that such an attractive tree has since been associated with sorrow and grief in the western world. The phrase ‘to wear the willow’ means going in mourning, especially for a sweetheart or bride, to bewail a lost lover. The desi name for the tree is Majnu, the lover with dishevelled hair lopping over his forehead and mad after Laila. It is a common folklore in the hills that if a branch of beunce (salix alba), a tree found near the watercourses, is planted upside down, gives rise to Majnu tree. Is it true? I have never tried it and have my doubts. The experts also say no-no to it. Both these trees have water-holding properties and are often planted near water ponds or springs. The common saying is that Lord Varun blesses him who plants these trees. Introduction of Weeping Willow to Shimla around 1821 is interesting. One dentist O’ Meara lived in Ravenswood, the cottage that had now been dismantled to construct the present High Court building. His uncle Dr Barry O’Meara was medical attendant to Napoleon on exile to St. Helena. When the exiled emperor died there, the doctor knowing his liking for the tree planted one near his grave and sent cuttings of that to O’Meara here. Those cuttings are said to be the mothers of all Weeping Willows in Shimla and around. Imagine a dream bungalow amidst Weeping Willows and a water pond (See photograph). White Christmas eluded the people of Shimla once again as it had done years after years. Professor S. K. Mehrotra, the eminent historian, met me once and asked me, "Isn’t white Christmas in Shimla an illusion?" I said, "Yes, in my six-decade-old memory bank, I have deposits of only a couple of white Christmases." He agreed with me. Everybody here speaks of white Christmas though guesstimate is only a few may recall having seen more than two white Christmases in their lifetime of say fifty years. Actually the expression gained popularity with the film of that title released in 1954. It starred Bing Crosby and Danny Kaye with Crosby singing the popular song ‘The White Christmas’ written by Irving Berlin. The film ended on a happy note with a scene of snow falling on pine trees and people raising glasses in honour of the romantic twosome, toasting, "May your days be merry and bright/And may all your Christmases be white." The hoteliers here advertise and sell it to the people in plains to attract them to Shimla during the baraa-din (longer day) holidays. That is why about 50,000 tourists have arrived here this year. The consultant culture prevalent in the Government of India has percolated down the state government too. There are consultants in many departments. I asked one of them, "What do you do actually?" He said, "Do you have a watch?" I was non-plus but jutted out my left wrist towards him. He looked at it and said, "The time is thirty-five minutes past two." I said, "Why are you telling me that? I could have seen it myself." He said, "That is exactly what I do as consultant. I borrow the watch of the department and tell them the time and get paid for it." Tourists visiting the ‘Queen of Hills’ to celebrate Christmas and New Year had a taste of Goa in Shimla. The Goan food and cultural festival organised by Himachal Tourism at their main hotel, Holiday Home, here was a big attraction during the Christmas and New Year festivities. People danced their way into the year on foot tapping English and Goan numbers rendered by Panjim. It was not just the tongue tingling delicacies, which people enjoyed but the Goan artists, including a guitarist and drummer enthralled the tourists as well as locals for almost 10 days. The coastal delicacies, seafood and drinks were a big hit. The menu included large number of seafood items like Fish marsella (fish curry in Goan spices) The Goan cuisine also offered some interesting dishes for the strictly vegetarians like Paneer peri-peri and vegetable capem gravy (assorted vegetables cooked with coconut). To add to the fun, the hotel has also been giving special prizes everyday to children and adults who add to the fun and festivity with their nonchalant dancing. Being part of the endeavour by the government to hold events all the year round, Himachal Tourism has been organising food festivals, throughout the year. The Kerala, Avadhi and Himachali food festivals organised in the past were well received by the people. "Food being a very important part of our culture, we thought why not hold food festivals so that people can get enjoy genuine cuisine from various parts of the country," said Mr Yogesh Behl, GM, Hotel Holiday Home. It was courtesy Aircel, a new entrant in the field of mobile operations in the hill state which gave people an opportunity to dance to the songs rendered by Abhijeet Sawant, the winner of Indian Idol, one of the most popular music programme on television. Abhijeet, with his simplicity and mellifluous voice won many hearts as he performed at Hotel Peterhoff, the venue of the programme. He enthralled the audience with the evergreen Kishore Kumar numbers but it was his own song, Mohabatein lutaunga, which drew maximum applause from the crowd. Even after achieving such great heights, Abhijeet comes across as the same humble and down to earth participant, who sang his way into the hearts of millions, as they voted to make him the Indian idol. Another popular face on television, Bhagwant Mann of the Laughter Challenge show, regaled the audience. There was nobody, be it the Indian cricket stars, Ektaa Kapoor serials or for that matter, Mr Navjot Singh Sidhu himself, who escaped the witty satire of Mann. Anxiously awaiting the draw of lots to decide the Municipal Corporation (MC) wards to be reserved for women and scheduled caste, the wards of Bharari and Lower Bazar once again proved to be lucky as they have till date not been reserved for women. It was the Mayor, Mr Sohan Lal who was most disappointed as his ward of Krishnanagar was amongst the seven wards reserved for women. Similarly, the CPM workers too were a disappointed lot as the lone ward of Summer Hill, which they had won, was reserved for women. It is the Summer Hill area, wherein the Himachal Pradesh University (HPU) falls, which is still considered communist citadel in the state. With the much-awaited draw of lots deciding the wards to be reserved for women and SC being over, a lot of aspirants for the reserved wards have suddenly started appearing. As such one can say that the draw of lots has sealed the fate of some while it could pave the way for a political career for others, who till yesterday were nowhere on the scene. With the seats for women and scheduled caste being reserved, lobbying for seeking the blessings of the ruling Congress or the main opposition party, BJP has already begun. The prestigious Chamera Hydroelectric Project (Stage-III) has achieved tremendous success by day-lighting a 366 mt-long diversion tunnel in the cliffs of rocky banks of the Ravi at Kharamukh dam site in Chamba district of Himachal Pradesh. The project, which is being spearheaded by Chief Engineer (In charge) K. K. Joshi, is ahead of its scheduled time. Applauding the endeavours by the project workforce, Mr S. K. Dodeja, Director (Projects) of the National Hydroelectric Power Corporation (NHPC), who recently inspected the ongoing works of the project, said the lining and concrete work of the diversion tunnel was also nearing completion which will divert the waters of the Ravi within the next few months to take on the construction of 68 mt high concrete gravity dam of the project. Mr Dodeja said the work on the main access tunnel, ventilation tunnel and six adit tunnels was going on in full swing and the three of the six adit tunnels had so far been completed as a result of determined devotion of the project workforce. The 231 MW Chamera Stage-III project is located on the Ravi in Chamba district which is a run-of-the-river scheme. The project, which is scheduled to be completed within a period of 5 year, will cost Rs 1405.63 crore. The project would operate under a net head of 200 mt to generate 1108.17 million units (MUs) of electricity in a 90 per cent dependable year and would provide a minimum of three hours of peaking during the lean season. The power generated from this project would be fed to the Northern Grid for further distribution to the beneficiary states of Himachal Pradesh, Jammu and Kashmir, Punjab, Chandigarh, Haryana, Uttaranchal, Uttar Pradesh, Delhi and Rajasthan. region, where several interior villages remain cut off due to inaccessibility. The NHPC is already spending over Rs 35 crore for the construction and widening of roads network in the environs of the project. In the light of the Tamil Nadu government’s decision on doing away with entrance tests for admission to professional colleges, the parents and educationists of this region have requested the state Chief Minister, Mr Virbhadra Singh, to do away with the entrance tests in Himachal Pradesh too. The students who have passed Plus two through the Himachal Pradesh Board of School Education should be admitted on the basis of the marks scored in ‘plus-two’ exams. The Tamil Nadu government has recently decided to scrap the entrance tests for admission to professional colleges. Henceforth, the marks obtained in the ‘plus two’ examinations will be on the basis for the admission to engineering, medical and other professional courses. They have suggested that students from the school boards of other states should also be admitted on the basis of the plus-two marks but the marks of various board exams should be converted into ‘standard scores’ using ‘mean’ and ‘standard deviation’ method. The scrapping of entrance tests would be a great relief for both students and parents. In their eagerness to get their children admitted into medical colleges, several parents were lured by touts who leaked the question papers for these tests and this led to the HP High Court canceling them and ordering for fresh tests and the ‘question paper leakage scam’ was exposed. The Bachat Bhavan, the only auditorium of Chamba, stinks with fetid smell, thanks to its faulty architecture. The doors of the toilets in the conference hall is just behind the VIP seats. The building is in a bad shape and cries for care. The conference hall of the Bachat Bhavan looks like a tea-stall. Where have the folk theatre, songs and dances of Himachal Pradesh vanished? Ask Mr Tara Pandit, a 73-year-old renowned Banthara folk theatre artist of the now defunct Prachin Banthara Club, Malwana in the Mandi district and he poises in pain and then replies, “Today’s generation is literally singing and dancing to the filmy pop tunes. Even if they try to perform folk arts, they in fact end up dishing out a khichari or a mixture of folk and pop arts”. The new generations of artistes have an ego problem and they claim they are superior, he comments. “The older ones are a scattered lot and an extinct species”, adds Tara Pandit, who assisted by the department once went from village to village and school to school, giving Banthara performances all over Mandi. But today, Tara Pandit is a disillusioned man. “The public want to see folk performances, but younger lot is not interested in learning them. Nor there is any serious attempt to promote them. It is a hopeless situation and perhaps we will lose our folk heritage perhaps forever”. Banthara, a satirical folk theater of Mandi is not alone in facing the music. The traditional folk songs, folk dances and folk dramas and hill ballads that once echoed in the Himalayan countryside are today singing a swan song one by one. The rich folk tunes and rhythms are slowly disappearing from the state perhaps forever. These rich folk arts forms have become the victims of the Bollywood-influenced modern popular culture of mixes and remixes, pop and op art items, which have spelled a death-knell for them over the decades, rue the folk artistes. The rich traditional folk art forms are disappearing at a time when the both the Center Government has created the North Zone Cultural Centre, Patiala and Indian Council for Cultural Relations, New Delhi and the state government has created DALC, all dedicated to protect and promote the folk art forms in the country. The artistes cite the “departmental apathy” and an “onslaught of popular Bollywood pop culture” as two major reasons that contribute to the sad demise of the traditional folk arts in the state over the years. The notable among the folk theaters that are as good as dead include Kariyala and Syang, the satirical theaters from Shimla district, Banthara. Says Mr Murari Sharma, who has penned a book on Banthara, “The folk artistes used to enact satire on the day’s social evils and enjoyed royal patronage. Today, Banthara is performed rarely in a mixed variety as neither artistes nor department is bothered to promote it in its ancient purity”. In fact, the plight of Shimla’s Jhuri, Lamans, Maulku (folk ballads and songs) and Mandi’s folk dances like Ludi, Bhag and Bhauia and its folk songs like Gangi and Sanskar Geet and Kulu’s Harantaran folk theater and songs is no different. Likewise, the Lanya folk marriage songs that once evoked joyous moods during marriages in the Kangra – Hamirpur – Bilaspur - Mandi belt have disappeared into anonymity now”, they lament. “Even the Mukhauta, mask folk art of Sirmaur is heading in the same league”. What has worsened the plight of the folk art forms is that the music teachers in schools and colleges across the state have no knowledge of the folk art forms and they end up aping up market “pop forms” and dish them out to the students, reveal the artistes. Who is responsible for the sad plight of folk arts? “Nobody else, but the Himachal Pradesh Department of Art Language and Culture (DALC) including the central cultural agencies, which have been dedicated to protect, preserve and promote the traditional art forms are responsible for the sad demise of the folk forms”, rue artistes. Even organisers of the state’s major cultural events – Shiv Ratri of Mandi, Lavi of Rampur, Minjar of Chamba and Kulu Dasehra and Renuka fair, Summer Festival, Tribal Festival, Hamir Utsav, Dharamsala festival- encourage Bollywood-influenced artistes and cultural performances rather than folk artistes. “The folk artistes find a passing reference at these events and the major share of both money and fame is cornered by the outside and local popular artistes, comments Ms Lalita, who a folk performers. “These events can be used to promote folk forms among the younger lot”, they suggest. After decades of neglect and apathy, the DALC today has wakened up to document the almost extinct folk art forms in the state. It is holding workshops and seminars to train students promote research and protect the folk art forms in the state. But sadly the response is poor. “The DALC and the cultural societies lack a dedicated approach and government’s support to sell and promote the folk forms among younger generation of singers and the would-be performers, reveal members of Mandavya Kala Manch (MKM), a Mandi-based cultural society, which hold workshops in folk dances, theatres and songs in the Mandi district for the last 18 years. The DALC Director, Mr Prem Sharma, says that the state government in association with the HRD ministry hold workshops and folk festivals from time to time and hire the services of experts to write and document “all the traditional art forms in the state. The folk art forms of Chamba have been documented during the Chamba millennium. The folk forms of Kangra and Mandi and tribal areas are being documented”, he claims. Mr Sharma adds that the experts and cultural societies impart training in the folk art forms, hold seminars for learners and teachers from school and college teachers from time to time. “We are holding folk festival next year to promote these rare folk art forms. The researchers are doing research on folk forms”, he adds. Dalhousie has fallen into the hands of land mafia. A few have begun excavations for multi-story flats in Upper Bokrota, which is a high security zone of this hill station and houses sensitive military gadgetry. Besides this, the area is a thickly forested zone, which is the sanctuary for endangered species like Monal pheasant and other wild Himalayan animals and birds. Fearing extinction of the endangered species of the pheasant livestock in a letter to Mr S. S. Parmar, Chief Secretary to the Government of Himachal Pradesh, Mr Simranjit Singh Mann, President, Shiromani Akali Dal (Amritsar) and former Member of Parliament who also owns estate in Dalhousie hills, sought probe into the constructions springing up clandestinely. In Upper Bokrota, concrete underground work is in full swing with steel stripes being fixed to make multistory buildings. In the interest of the public cause, Mr Mann demanded the Chief Secretary to intervene immediately to save the greenery of Dalhousie forests, wild life and also India’s security system. “About three years ago, as a Member of Parliament, I had brought to the notice of the Chief Minister of Himachal Pradesh of the activities of a unscrupulous land mafia operating in Dalhousie,” says Mr Mann. In Dalhousie, Upper Bakrota is the highest hill, covered with deodars, silver firs and firs, besides deciduous woods of many varieties. The highest point on this hill is approximately at an altitude of 2650 metres, where there is an estate of the Mukherji’s in which Rabindra Nath Tagore had stayed for sometime. 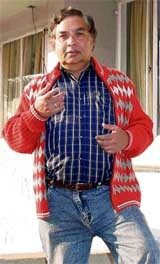 Mukherji had a distinguished career in the Punjab cadre of the ICS, went on to become the Cabinet Secretary and finally the Governor of the Punjab. Jawahar Lal Nehru too visited this place, which was named Snowdon by the Britishers. Now Snowdon is a sensitive communicating point of the Indian Army. Overlooking this hill is another important landmark at Dain Kund - air force strategic installations. Another important factor is that Upper Bakrota is home to a variety of pheasants, especially the endangered and rare Monal pheasant. Apart from this, one finds leopard, Himalayan bear, Kakar deer, Himalayan fox and a host of other species. “When the sanctity of the wild is violated by the land mafia in connivance with the bureaucracy, I do not know how we will preserve our sacred environment,” Mr Mann expressed concern. Mr Mann demanded the state government to put a stop to this. Lack of water supply to the Basaal based housing colony of the Himachal Pradesh Housing and Urban Development Authority (HIMUDA) is now compelling people to look for alternative accommodation. The repeated assurances given by the authority have failed to address the problem. The 72 flats here had remained unoccupied for more than a year with no arrangements for water in the colony. Barely few flats have been inhabited and a majority of the owners have not shifted here due to lack of water. Water tankers had finally been arranged. But the residents claim that due to leakage in the entire system little water reached the houses. HIMUDA finally decided to give possession of these flats to the owners in July this year. HIMUDA, which has been battling with water problem, had tried to work out various arrangements with the IPH department as well as the local municipal committee. Initially they tried to work out an arrangement with the Municipal Committee to provide 25,000 litres of water daily. With the town itself facing an acute shortage of water, especially in the peak summer months, it was unable to spare water for this colony which lies outside the committee area. These flats were sold only last year. Earlier an agreement was signed with the Irrigation and Public Health Department (IPH) to provide three lakh litres of water per day to the colony. This couldn’t materialise as the department was barely able to meet town’s requirement. Investors were now finding it hard to stay here with no assured water supply. They complain that it was illogical on part of HIMUDA to expect them to shift when the basic amenities were not available. HIMUDA had earlier made it mandatory to take possession within 45 days or else face a penalty in the form of 0.1 per cent monetary fine per day. This was seen as a very harsh and uncalled for measure by the owners of these flats. The officials of HIMUDA however claim that water was being made available through tankers and leakages would soon be repaired. It was a novel way of partying for a cause. Everyone partied through the night to welcome the New Year but shelling out some extra bucks, which will make a difference in the lives of underprivileged children, was a great gesture. The tourism officials at Hotel Holiday Home here were able to raise Rs 25,000 for charity at the New Year bash. As is the normal practice, a cake is cut at midnight to usher in the New Year but this time the officials decided that there would be bidding for the person who wanted to do the honours of cutting the cake. There was proper bidding, which started at Rs 1,000 and went up to Rs 25,000. It was Ms and Mr Suresh Guleria from Kangra who opened up their hearts and wallets to give Rs 25,000 for just cutting the cake at the party. It’s a different matter that in the process of raising some donation for the underprivileged and needy children, the cake instead of being cut at exact midnight was cut a little later. For the Guleria’s it was not the honour of cutting the cake at the party, which mattered but getting the opportunity to help some needy children was far more important. The money given by Mr Guleria will be given to the School Home for Visually Challenged and Hearing Impaired located on the outskirts of the town at Dhalli. The institute having about 150 children from all over the state is being run by the HP State Council for Child Welfare. Encouraged by the magnanimity and generosity shown by New Year revellers at the party, the tourism officials now feel that they can start bidding for cutting the cake at all their hotels, where such parties are organized on New Year. With tourists from all over the country coming to the ‘Queen of Hills’ to celebrate New Year, they are hopeful that charity through party will help make some difference in the lives of these children. It sure would be a very noble gesture, which will help improve the life of these children facing disabilities and other difficulties in life.